Sometime during the mid-17th century, on the island nation of Japan, a man by the name of Tokugawa Ieyasu managed to unite the country in peace. He formed a military government by the name of the Tokugawa Shogunate and became head of it as its shogun. Shortly afterward, a man named Kigata Doman attempted to overthrow the Shogunate through the use of forbidden magics and incantations. Fortunately, his plan was quickly thwarted. Rather than execute Doman, they decided that it would be better to exile him from the land to a place known as Hyakki Island. Ten years later, a package arrives at Edo Castle from Kigata Doman addressed from a location known as Hyakki Castle. Upon being opened, a spell is cast on the castle which swaps the castle’s royal guards with the country’s exiled prisoners. Realizing that this doorbell doo-doo bag was no practical joke, the current acting shogun, Iemune, calls upon a secret government unit that specializes in supernatural activities. This Spook-A Team is then officially tasked with infiltrating the island of Hyakki and its castle to exterminate Kigata Doman and restore peace to the citizens of Japan. However, due to some unfortunate setbacks, one of your party members must first escape from the castle basement and rescue his other three comrades! If you read this description and have found yourself to be in a state of confusion and befuddlement, then you are pretty much in the same position that I found myself in when I initially booted up Hyakki Castle. 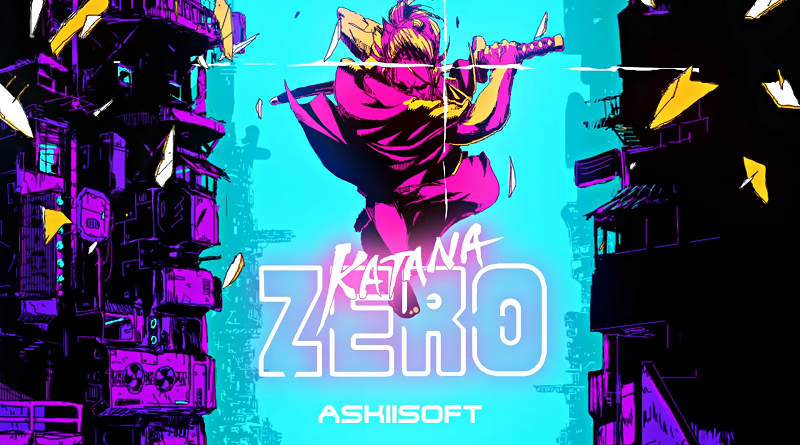 And while I do appreciate that the folks at Asakusa Studios took the time to write that initial scenario, much of it based on real-world historical events, it is mainly for setting the mood and atmosphere of the universe in which you are playing. The story itself doesn’t really into the game’s overall experience. Ninja and Sohei and Shinkan, oh my! The first order of business to getting this Feudal party started is to, well…create a party! A team in Hyakki Castle consists of four members, with each male or female member being one of four races: Human, Oni, Tengu, or Nekomata. Each of these races comes with their own base stats. From there, they must each be assigned a job of Samurai, Ninja, Sohei, or Shinkan. Each job comes with its own boutique of abilities to be gained and also has an effect on the base stats resulting in 16 different permutations of stat configurations. Last but not least, you must assign a name and character portrait for each character. 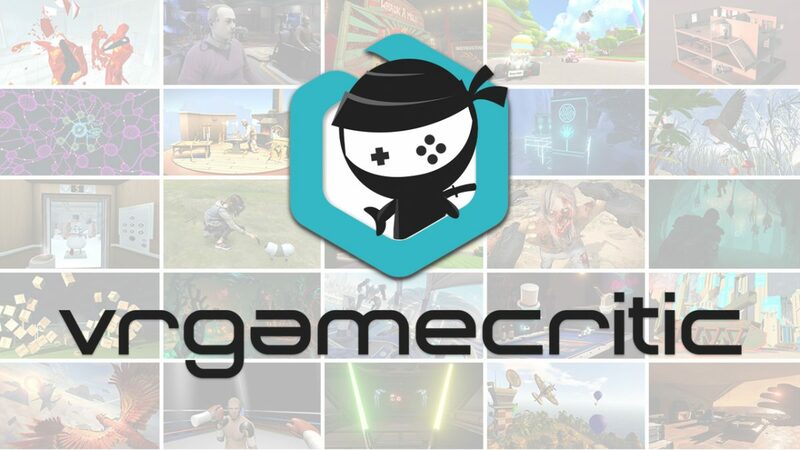 While options for creating your party are fairly limited in comparison to other games of this genre, there is still room for a decent amount of creativity and personalization. After all, how many games out there allow for you to combat evil through the use of a Fearless Feline Foursome?! This is just one step closer to that Samurai Pizza Cats video game that I’m still hoping for. Every time a character levels up, in addition to the HP, MP, and Hunger recovery, they also receive a skill point stipend. These skill points can be used in order to improve your character in one of the two areas of character growth: Active Skills and Passive Skills. Active skills are the abilities linked to your attack and defensive moves, assigned to a character via the attack buttons. These are usually attacks of the projectile or melee variety, or defensive moves made to utilize one of the game’s four elements: Neutral, Fire, Water, and Earth. All enemies do damage related to one of these categories and are susceptible to different elements as well. Passive Abilities, on the other hand, are augmentations to each character that remain in effect indefinitely once earned. Unlike Active Skills, Passive Abilities are earned automatically upon reaching level-up milestones and make for a great reason to stomp some yokai mudholes instead of simply cowering from adversity. Those who’ve played the Steam title “Legend of Grimrock” will already have a heavy understanding of how this game operates. 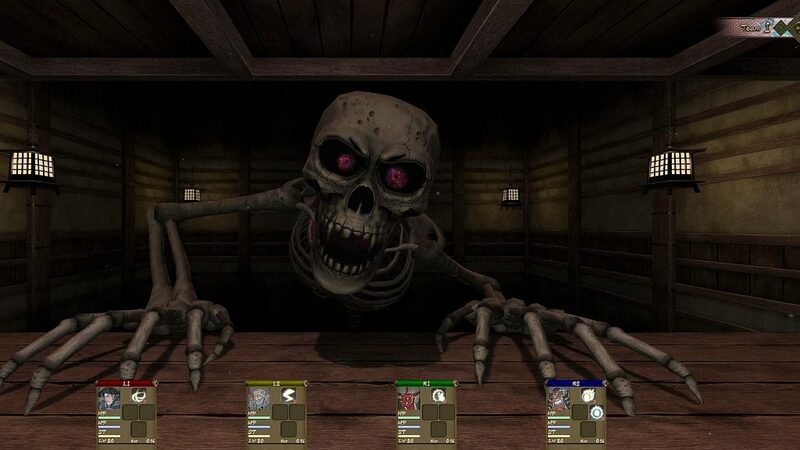 Like that game, Hyakki Castle is a 3D action-lite dungeon crawler that is, thankfully, not procedurally generated. Beginning in the lowest levels of the massive castle grounds, your task is to ascend the structure and take out its ruler, Kigata Doman. The player begins with their four different characters. However, the aforementioned introduction does a great job of getting the player accustomed to the key gimmick in this game’s gameplay arsenal: the ability to split your team into two parties. In Hyakki Castle, Team 1 consists of the lone uncaptured party member and Team 2 includes your other three characters locked away in a prison cell. The screen is split and the view for both teams is present. In addition, the view can be solely of one team’s line of sight but this should only be done if the out-of-sight team’s safety is all but assured while they wait. Only one team character icon may be manipulated at a time by switching between them with the press of a button. Once Team 2 is rescued from their dank prison, both teams can be fused into one for easy dungeon exploration! The party members can also be separated again and reorganized into whatever configuration the player desires. Breaking up into teams serves a number of interesting purposes. Hyakki Castle‘s promotional materials made it sound like breaking into teams and flanking your foes was a good idea due to the fact that you’ll need to regularly use dexterity to dodge incoming attacks. They also advertised that it can be used in order to overcome puzzles which require more than one unit to solve. This is true, though all of these puzzles mainly revolve around one unit standing on a pressure switch while the other proceeds ahead through whatever gate the switch opened. While the dual-party system doesn’t do much to spice up the puzzles, what it does do is provide the player some welcome added security. Tricks and traps abound in this game. Enemies frequently pop up in unexpected places. And traps of the spike or flame variety can one-shot your entire team. Thankfully, you can utilize the split party system to send a small band ahead for reconnaissance. In the event that they meet their untimely demise, you can send the backup unit to retrieve them and revive them. In truth, this is how I most effectively put this gameplay mechanic to use, and I came to really appreciate it in the long run. 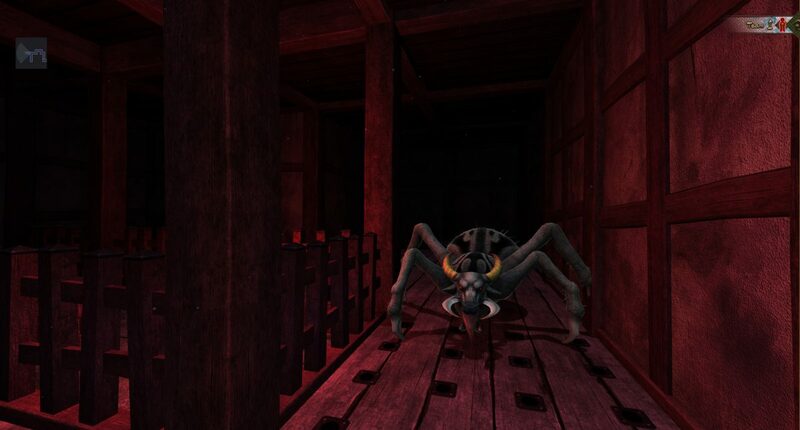 The aforementioned enemy adversaries come in the form of yokai which will impede your progress through the hallowed halls. They come in a variety of flavors ranging from creepy undead samurai to the grotesque and comical monster that I have nicknamed the “walking flab fold baby” and they do a great job of adding to the already creepy haunted castle atmosphere being presented in this package. Combating these enemies is done in a rather interesting way. Each party member is assigned a single button. By holding it down, you place emphasis on that character’s set of four assigned skills which are assigned to an additional face button which, once pressed, will activate the skill and initiate its cooldown phase. What this means is that you can rotate between party members and their respective skills in order to overwhelm an enemy – many times before they even get a chance to retaliate. But the thumbstick or keyboard must always be at the ready to either sidestep or step back in order to evade an enemy lucky enough to survive your sadomasochistic pain barrage. Each hit from a foe will decrease a party member’s hit point gauge, each use of a skill will decrease their magic point gauge, and every action whether attack or movement will decrease their hunger meter. Both HP and MP will replenish slowly over time or at save points though there are items to give immediate relief when needed. Hunger, on the other hand, can only be replenished by leveling up or through the use of food items located in treasure chests, jars, or as dropped loot from yokai. Every couple of floors the player will be faced with a massive yokai boss that won’t be felled by a mere four-strike combo. While I never found any of these foes to be particularly challenging, they did change up the pace of gameplay and left me standing on pins and needles due to the fact that it never takes much damage to send your party to an early grave. 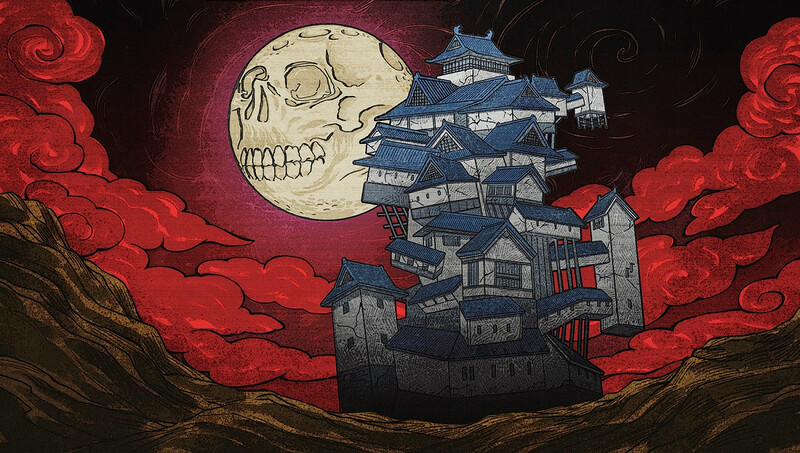 Ultimately, I came into Hyakki Castle with measured expectations and came away with a game that honestly kept me entertained throughout my experience. I do wish that it had more music as it was only around for the game intro and the multiple boss battles. But I can understand that they were pushing more towards setting an unsettling atmosphere through the use of silence and sound effects. It’s also a shame that the controls weren’t better explained, as well since I spent a bit of time trying to teach myself how to properly join my two teams together due to the in-game instructions not mentioning how this is done. Still, as the sun set across the horizon, I managed to figure these things out for myself and still enjoy my time with some quality dungeon-crawling entertainment. If you are seeking the location for your next journey into the expansive unknown of adventure, then you would do alright by making that destination Hyakki Castle. Full disclosure: This review is based on a review copy of Hyakki Castle provided by the publisher.